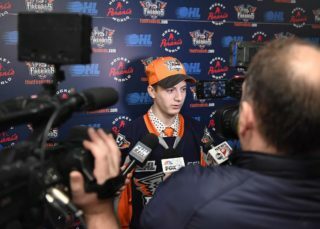 Flint, Mich. – Jake Durham recorded three goals, Eric Uba tallied a three-point game and Kyle Harris, Ethan Keppen and Hakon Nilsen all lit-the-lamp for the Firebirds en-route to a 7-4 victory over the Sarnia Sting in front of “School Day Game” audience of 3,534 fans at the Dort Federal Credit Union Event Center Wednesday. Sarnia’s Mitch Eliot scored back-to-back goals within 24 seconds in similar fashion to earn the Sting an early lead. At 6:32, Eliot swatted a puck down out of mid-air to keep the play alive before joining the rush and converting on a pass from Anthony Salinitri backdoor. Then, Eliot increased Sarnia’s lead to two on a pass from Ryan McGregor backdoor at 6:56. Then, Salinitri picked of a pass while shorthanded in the neutral zone and scored on a breakaway, glove-side, past Flint’s Luke Cavallin to tie the contest 3-3 with 2:27 remaining in the second period. Sean Josling would score Sarnia’s fourth and final goal with 3:03 remaining on the left side of the goal. Ethan Keppen added the empty net tally at with 2:15 on the clock. Luke Cavallin earned the victory making 23 saves on 27 shots. Flint was 1-for-4 on the power-play and 3-for-4 on the penalty-kill. 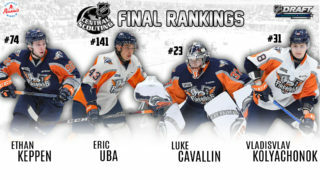 The Firebirds won 35 face-offs compared to Sarnia’s 31. 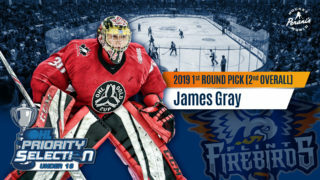 Next Game: Flint is back in action this Friday for the Firebirds’ annual “Military Appreciation Night.” Puck drop is set for 7 p.m. (ET) against the Sault Ste. Marie Greyhounds. All active military personnel and veterans receive complimentary tickets courtesy of HAP, Comcast Business, DM Burr & The View Newspaper Group. The Firebirds will be wearing special white camouflage military themed jerseys that fans can bid on in a live jersey auction immediately following the game.